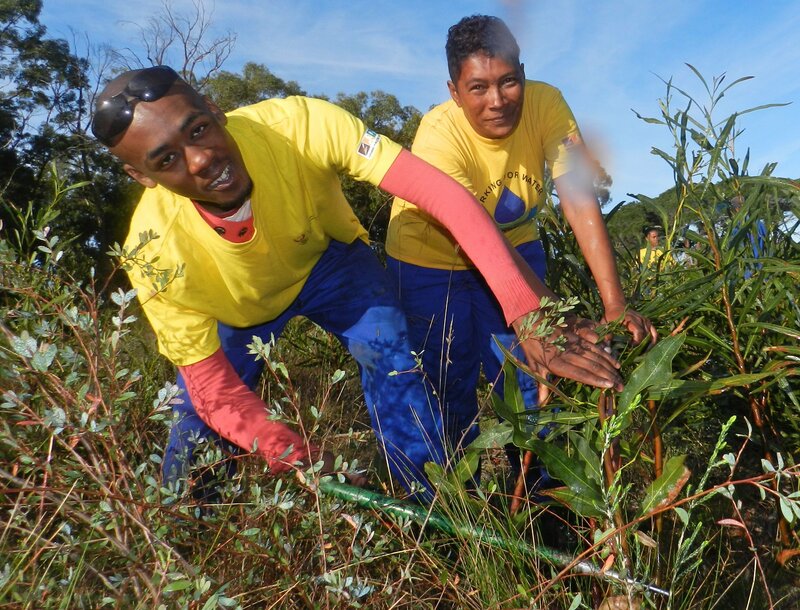 Fire management and the threat of invasive alien plants in the Overberg were key themes raised at the Agulhas Biodiversity Initiative (ABI) annual general meeting. The meeting was held on Wednesday, 24 June, near Napier. ABI, a landscape initiative working across the Overberg region, has been operating since 2003. The ABI Partnership works together to secure a productive and healthy natural environment in the area. The AGM is ABI’s third since becoming a voluntary association. Private landowners, government department officials, officials from CapeNature and SANParks, and NGOs joined the meeting. ABI is chaired by Agri Wes-Cape President, Cornie Swart. According to Dr William Stafford of the Council for Scientific and Industrial Research (CSIR) at the meeting, the Agulhas Plain (the region between Hermanus and De Hoop) has been selected to form part of a study to investigate the use of invasive alien plant biomass for energy. The study is being funded by the Department of Environmental Affairs (DEA). The aim of the study is to see how much invasive alien plant biomass is available in the area, as part of the ABI Alien Clearing Project – a project coordinated by ABI and supported by DEA, which is clearing about 30,000 hectares per year, and creating 160 jobs. The CSIR study will also investigate the feasibility of biomass to energy projects, assessing the opportunities for local or regional energy use, versus supplying the national grid. Additional products from biomass, including heat, charcoal and biochar, will be considered. Dr Stafford said, “There are 160 million dry tons of invasive plants standing on the landscape in South Africa. And these invasives are spreading at 10 percent per year. That’s a ten-fold increase if we do nothing.” He said that Working for Water programmes had managed to reduce that spread by one percent. “But we want zero percent growth – that’s the ideal situation.” The study will be completed by end-March 2016. According to Louise Wessels, Manager of the Greater Overberg Fire Protection Association (GO FPA), there is renewed focus to integrate fire- and invasive alien management. The Agulhas Plain has also been selected as a pilot site to study how the two are integrated, as part of the Global Environment Facility (GEF) FynbosFire Project. She said GO FPA had highlighting support for prescribed burns in the Overberg, with Working on Fire teams helping with firebreaks or providing invasive alien clearing (fuel load reduction) support during the winter months. She said in the past there had been a reluctance to conduct prescribed burns, but this year had seen a remarkable increase. The renewed awareness of the importance of prescribed burns as a fire prevention strategy was seen as the reason for this. During the AGM, partners elected Cornie Swart to remain as ABI Chair. The ABI committee elected at the AGM is: Tierck Hoekstra, Dr Odette Curtis, Bulelwa Msengi, Rory Allardice, Maarten Groos, Dr William Stafford, Lesley Richardson, Russell Metcalf and Hennis Germishuys.